Al-Azhar mosque is also known as “The Most Resplendent Congregational Mosque“. The one who commissioned its construction was Al-Mu’izz li-Din Allah of the Fatimid dynasty in the new capital of Egypt in 970 by the builder of Egypt, Gawhar El-Seqelly. The construction work lasts for about 3 years. The name of the mosque is believed to be taken from the name of the Prophet Mohammed’s daughter “Fatima”. Because it was the first mosque and the first Islamic university to be built in Cairo, the city was named since then “The city of a Thousand Minarets”. After Al Karaouine in Idrisid Fes, which is a university in Morocco, Al-Azhar has developed to be the second most important university in the world. Al-Azhar was first established in the first place as an educational institution to teach Shi’ite theology and its main target was to spread it all over the country. It is located in El-Hussein Square. The original size of Al-Azhar was actually half of what it is today as many additions and restorations have been held in the building through the different eras in Egypt. The earlier one consisted of one Sahn “An Open Courtyard”, three iwans “Praying Halls”, and the main gate was located on the western walls of the mosque. Moreover, there is a Mamluk style dome and an old Mihrab decorated with ornaments and Kofi writings from the Noble Qur’an. There were three gates in the southern, Northern, and western walls of the mosque. Gawhar El-Seqqely built the minibar but it was transferred to El-Hakim Mosque. During the Fatimid Period, a lot of changes occur in the construction of the mosque. 27 terrific lamps were added to the mosque by Al-Hakim be’amr Allah and he also established a new mihrab made out of Aro Turkish wood for the mosque. The Al Hafez Le Dine Allah, the Fatimid Caliph, wanted to expand the mosque in 1149 AD. He added additional space to the Sahn and added some decorations to the mosque’s walls. During the Mamluk Period, Al Zaher Baybars wanted to build a minibar in 1266 AD but nothing remained of it except its written instructions. The Tabrisy Madrasa Islamic teaching institution was built by Baybars Khazendar, who was the army commander in the reign of Al Nasser Mohamed Ibn Qalaun. The construction of madrassa added bigger space to the Mosque which hosted Islamic teachings classes and also had a large Islamic library. Then this was followed by the construction of the Afghaweya Madrasa in 1340 A.D. This madrassa contains the library of Al-Azhar in the current time. There is another small school which was called Al Gawhareya Madrasa that contained four iwans and a small sahn. During the Ottoman Empire, Al-Azhar witnessed many achievements and changes and the most memorable achievement among them was the work of Amir Abdel Rahman Katkhuda in 1753 AD. He added a riwaq (portico) behind the mihrab in addition to a new minbar & a mihrab. He was responsible for building the gorgeous western gate, which is now the main gate, and added two other gates. The supreme council of antiquities was also responsible for restoring Al-Azhar in the modern time. During the fighting between the French & the British occupation, Al-Azhar played a major role in forming the history of Egypt. 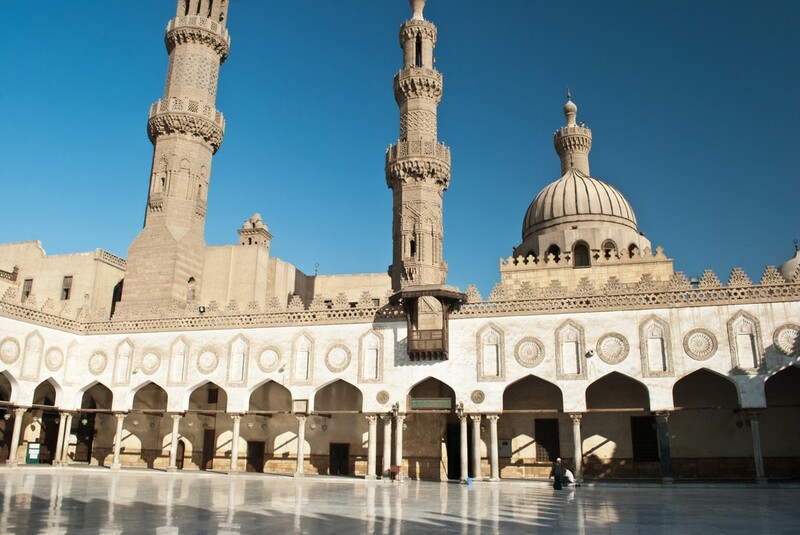 Al-Azhar now consists of five fine minarets with small balconies and carved columns. There are six entrances and the main gate leads into a small courtyard and then into the Aqbaughawiya Medersa to the left. The Taybarsiya Medersa is located on the right and it has a very fine mihrab. The Entrance of Qaitbay was built in 1469 and has a minaret at the top. Inside El-Azhar, there is a large courtyard inside, which measures about 275 by 112 feet. This courtyard is surrounded with porticos that are supported by three hundred marble columns of ancient origin. There is the prayer hall, which is larger than the courtyard to the east. Surprisingly, the Kufic inscription on the interior of the mihrab is original, although the mihrab had witnessed a lot of changes and modifications. Egypt always full with the ancient culture, civilization, and history, so after reading these amazing facts and information about Al Azhar mosque, we have well created Cairo day tours if you are already in Cairo, and Egypt tour packages if you plan to visit Egypt and discover these wonderful attractions.